Pyramid power is super natural or paranormal properties of the ancient Egyptian pyramids and objects of similar shape. This power, is said to preserve foods, improve health function, align us with our higher vibrational frequency, cure illness and disease and cause other dramatic effects. Food kept under a pyramid will stay fresh for two to three times longer than uncovered food. Artificial flavourings in food will loose their taste, but natural flavours are enhanced. Spectrographic reading of the treated item will show a change in the molecular structure. The pyramid will dehydrate and mummify things, without decay or mold growing. Persons living, meditate, work or sleep inside of a pyramid building or under a pyramid framework, generally feel immediate positive reactions. Creatures and nature are magnetically attracted to Pyramid replicas and devices. 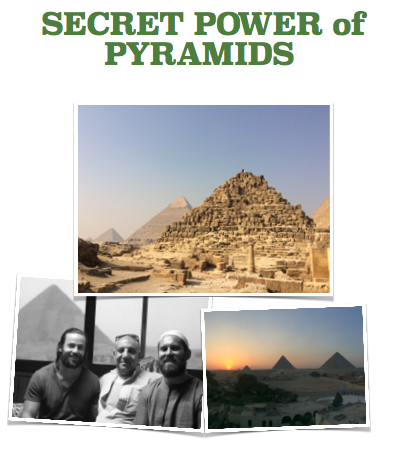 Bill Kerell is a researcher who experimented with pyramids for about 17 years. He has done many experiments using brine shrimp. Brine shrimp usually live 6 to 7 weeks; but under the pyramids, Bill has kept them alive for over a year. He also noticed that pyramid-grown shrimp grew two to three times larger than normal. Bill has also done a lot of work with humans. One of the things he and his associates have found is that hypertensive individuals become tranquillised, but lethargic people become energetic again. A lot of work has been done with individuals who meditate. The theta and alpha brain waves are increased. These frequencies are also higher and the signal strength is twice the 9amplitude of normal. Dr. Carl Benedicks (a Swedish scientist) discovered that the pyramid produced a resonance or frequency inside it. Two German scientists, Born and Lertes, also discovered that this frequency was in the microwave range. Researchers discovered that items placed under a pyramid stay “charged” for various lengths of time after being taken from under the pyramid. Crystals, Ormus and water keeps their “charge” longer than anything else. A Canadian hospital tried using a pyramid in their burn ward. The results were that after being under the pyramid for a few minutes, the patients’ pain started to reduce. Negative Ions help to reproduce and repair body cells. They’re transmitted into the body through the air and are circulated by the blood. Too many positive ions (the result of air pollution) can cause depression, and ultimately, illnesses. Thus, negative ions have a beneficial effect on the body. Pyramids generate negative ions. In addition, they are believed to have a generally balancing effect on the body’s electromagnetic field. This effect is greatly enhanced if the materials used, is gold or copper. * Charging Crystals is a popular use with pyramids. Quartz crystals are most effective for that, as they hold the charge for several weeks. These crystals can then be used for healing purpose as they release their charge into the surrounding. * Many people put their drinking water in pyramids to charge it with the pyramid’s negative ions. It is recommended to put a glass inside a pyramid for about half-an-hour, and large quantities overnight. * The pyramid activates the energies of the pineal and pituitary glands Users experience balance, relaxation, tranquility, well-being, and in some instances, the reduction of headaches. Egyptologists have found well preserved grain in tombs that is thousands of years old. In sharp contrast, grains stored in modern silos usually spoils after only a few seasons of storage. Grain in modern silos usually keeps no longer than four years. The preservation of organic material in pyramids has received a lot of attention in popular books. In the 1930s, a Frenchman named Antoine Bovis observed that a dead cat in the Great Pyramid did not decompose. The animal apparently wandered into the King’s Chamber and perished before finding an exit route. The cat’s body dried out, although the air in the King’s Chamber is always humid. Bovis’s observation gave rise to the idea of ‘pyramid power,’ which preserve organic matter. Advocates of pyramid power include a French radiologist named Jean Martial; an electronics engineer from Prague named Karl Drbal; author and biologist Lyall Watson; and physicist Patrick Flanagan. At Saqqara, Egypt, Egyptologists excavated a tomb of a woman of lesser nobility. In accordance with funerary customs, an elaborate meal was set out on pottery platters. The meal consisted of porridge, quail, kidneys, pigeon, fish, beef ribs, triangular loaves of bread, cakes and fruits. Their state of preservation was so excellent that Egyptologists easily recognised all of the foods in the entire meal, although it is almost 5,000 years old. The example suggests that shape is the key to the phenomenon popularly known as ‘ pyramid power. Psychics who use pyramids in that fashion have achieved an altered state of consciousness more rapidly than they would have otherwise, placed on the head focussing through the chakra system, during Meditation sessions, clearing psychic passages which may have become blocked. The pyramid is a geometric amplifier which increases the power of prayer and can strengthens or quicken a spiritual request. Pyramid Meditators suggest that the best results are achieved by sitting upright with the upper chakras located approximately one third up from the pyramid base directly under the apex or centre. The use of a pyramid in meditation can excellerate the process bringing feelings of calmness, wellbeing and a more open and positive attitude. Many users claim increased memory recall, visions of past incarnations, telepathic communication and an expansion of awareness or reconnection. The Pyramids of Giza maybe power plants built to generate energy based on natural technology from the running water and the rays of the Sun with the limestone that acts as a transmitter. This process of implosion also creates free energy utilised from natural resources without combustion or explosion, therefore creating no wastes or toxins. This type of free energy is high vibrational and harmonic which naturally affects consciousness, lifts and enhances the quality of life on Earth. To amplify this process they are built on top of natural power points, leylines of nature and energy centres on planet Earth in alignment with the stars, specifically Orion, Sirius, the Pleiades and constellation of Leo, which is ruled by the Sun. Sound and Light frequencies were used to broadcast and amplify this energy and activate the harmonic transmissions. At the time this type of knowledge was utilised, the awareness of such techniques was common. Somewhere around 26,000 years ago we had already harnessed sound and light technology based on zero point energy. As frequency, the transmission of particle wave radiations works with the elements and the forces of nature to build and create in alignment with source and universal bio dynamics. This was done with a high level understanding of universal physics, magnetism, pure energy, vibration, polarity and the nature of the space time continuum in relation to Consciousness. The Harmonics created are expressed through music, language, mathematics, dance, architecture, sculpture and geometry to support life itself and enhance this consciousness. They create resonance which is the key for transmissions of cosmic energy from the infinite potential to the finite vessel. Echoing with the music of the spheres through the vast continuum of space within a 64 tetrahedron grid that is the nature of creation endlessly repeating itself on different scales. Understanding this fundamental knowledge will lead to quantum leaps in our creations, way of life, and eventually naturally to a Golden Age where we are operating with optimum capacity and fully activated senses. Full Awareness. The laws of creation are mastered through consciousness which already created them, leading to advanced natural technology that applies deep spiritual formulas in universal physics. It is fully integrated wholistic science. Understanding how this sacred science works is like putting the pieces of the puzzle together to see the big picture. How Consciousness creates and how Creation works. It is all connected. As consciousness devolved into a dark age, knowledge of the Golden Age was lost. This was the real catastrophe which resulted in the energetic drop of frequency levels and awareness on the planet. This has led to the manipulation, misuse of power, ignorance and destructive force we know of today. What is referred to as the giant crystals in Atlantis looks to me like Ancient Egyptian Khemitian heritage that is right before our eyes, those same pyramids, obelisks and crystal altars that were operating with crystalline structures, ley lines and natural elements based on advanced natural technology are evidence of this true science, which is Universal. What we see remaining from this planetary network of energy systems that works with the Earth’s magnetic field & biosphere is based on superior natural intelligence. This intelligence is nothing more than who we are and is our natural birthright. The self organising principle. As the SUN enters a new cycle all the knowledge is coming back at an accelerated rate. We see evidence of the collapse of such power structures in the archeological sites that host them today. There is still buried technology, hidden chambers and advanced devices in secret chambers underneath the Giza plateau. This is obvious. And is not only the case in Egypt but all around the world from China through Tibet, India passing through Africa and Europe all the way to Peru and Mexico. There has been military bases, secret research, censorship, scientific evidence, meta programming devices and brain washing programs built around these areas and specifically working with an artificial planetary grid to distort the frequencies, limit consciousness and disconnect people from nature and the truth. This manipulation extends to world governments, military elite, international organisations, capitalism, consumerism, money, banking, corporations, democracy, media, education, culture, written history, energy use, labor, nutrition, medicine, insurance, law and legislation, politics, bureaucracy, religion, conventional knowledge and even science, everything that is mainstream, to cover all areas of life as part of the plot to limit evolution, devolve consciousness and enslave humanity to a parasitic nature with artificial intelligence that acts as police. Which is really the shadow energy working its way to integration as we harness the untapped potential in our subconscious beyond polarity, thus owning our power, accessing unity super-consciousness and completing the Great Work. Fortunately our Power is limitless and we can transmute all of this with Awareness and Love. Truth is nothing can stop the course of evolution from taking its place. Resistance is futile and may sometimes actually act as a catalyst to speed up the process! Due to the written misinformation and manipulation that has become the mainstream source of reference in the world, among other factors such as the dogma and brain washing control enforced by world governments, politics and institutionalised religion / education, and censored science, this knowledge of natural law and what really went on remained underground, preserved by the rich cultural inheritance of indigenous cultures, elders, grandmothers, oral traditions and folk knowledge that goes way back to the Ancient World and Pre Historic Matriarchal society, ultimately beyond planet Earth. This type of knowledge and its keepers became targeted by those who wish to maintain the status quo to limit freedom and sovereignty. In every age we see traces of this melodrama taking place. Any one who pays attention cannot be fooled by it though. What is underground eventually has to surface. As we enter into a time of awakening, a time of rebirth, this awareness is activated once again from within our cellular memory, DNA, and genetic code by the rays of the Sun directly and this is the nature of our time. This is why AWAKENING IS INEVITABLE. There is no way around it. It is happening as we speak. And like the photons of the Sun we bounce energy and light off each other transmitting the information directly with no interference for this body itself is a cosmic vessel, transmitter, antenna. And when supported with consciousness harnessing the forces of nature there is no limit to what we can achieve and create. This is real progress on the horizon of human evolution. It has been done before by few and now is time to share the reality with many. The gene pool holds the script. The Akashic Records. The manual. The blueprint design created by the Grand Architect. It contains the Pure Blood Lineage of Light that is yearned for by many, it is our natural birth right, who we are, so don’t look any further. Just know thyself and you will know the Universe, Nature and God. Truth fractals out of singularity & pulses through eternity with harmonics of sound light creations. The Cosmic Heartbeat.. The science of Consciousness is demonstrated in universal physics where Love is the Law. Access to such things as the philosopher’s stone, arc of the covenant, the Sun disc, the holly grail, fountain of eternal youth, tree of life, immortality, mono atomic gold and so on are mere results of activating the Golden strand DNA that leads to Awakened Super Consciousness. This awareness is a spiritual technology that already exists within us and when harnessed can save humanity from further destruction and suffering. As we learn how to build up, maintain and preserve our energy levels from base to crown harnessing sexual energy, chi, creative life force all the way from the bottom up, from our physical to the spiritual bodies we give birth to ourselves and begin to awaken to our SOVEREIGN multi-dimensional existence and true place in this epic cosmic divine order. This is the Immaculate Conception that leads to Transfiguration. Full Self Realisation. True bliss and Sacred Union. Awaken to the true POWER of your SOVEREIGN BEING in the network of ONENESS.